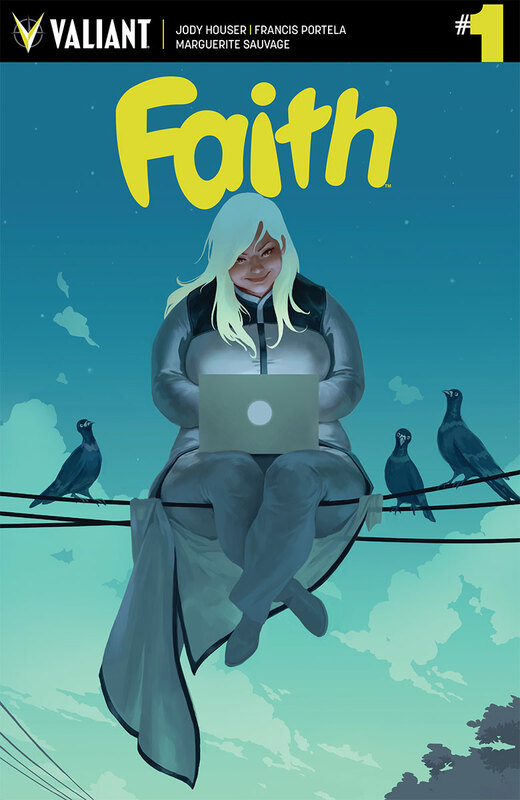 The Fellowship was fortunate enough to obtain a copy of FAITH #1 from Valiant Comics. The story is by Jody Houser, with art by Francis Portela, Marguerite Sauvage and Joe Quinones. The colors are by Andrew Dalhouse and lettering is by Dave Sharpe. Faith is in the process of building a new life away from The Renegades and UNITY by moving to Los Angles. She continues her heroics as Zephyr (which is her dream come true), but now has a secret identity as a blogger named Summer. Things seem to be going okay, but not to her expectations. The latest mystery has Faith excited, but she does she know what dangers lie ahead? She may not look like it, but Faith is a heroine in the classic sense. She is a dreamer with a very positive attitude, but very aware of the world surrounding her. Faith is a totally relatable character that you can’t help but root for. Kudos to Jody Houser and the gang for showing the world that Faith deserves the spotlight she's getting. The only bad thing is this is only a mini-series…currently. However, things change. FAITH #1 is in stores now, or available for ordering at www.valiantuniverse.com.